Lawrence Millman, (orange and brown cap) examines a mushroom that has teeth. 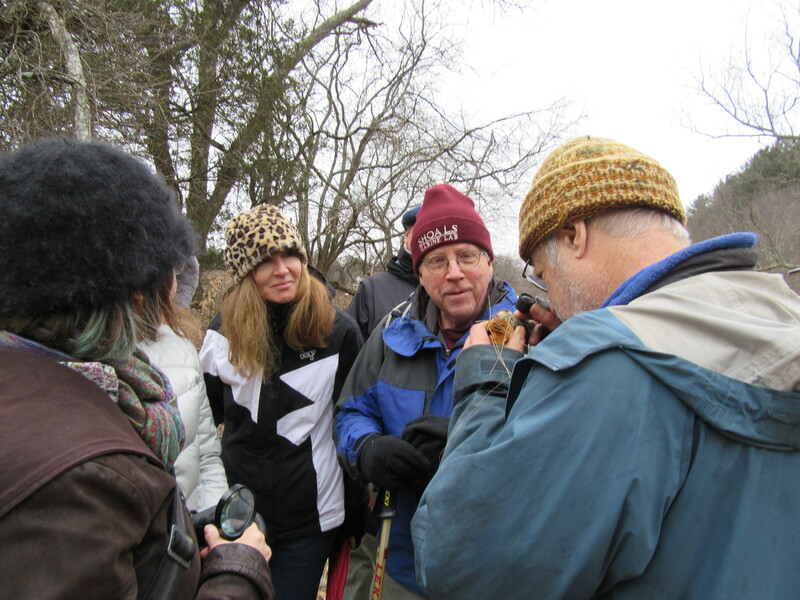 While the rest of the country was distracted on Super Bowl Sunday, a small band of Thoreuavians led by mycologist Lawrence Millman headed into the Estabrook Woods for the inaugural Super Cup Fungus Sunday. 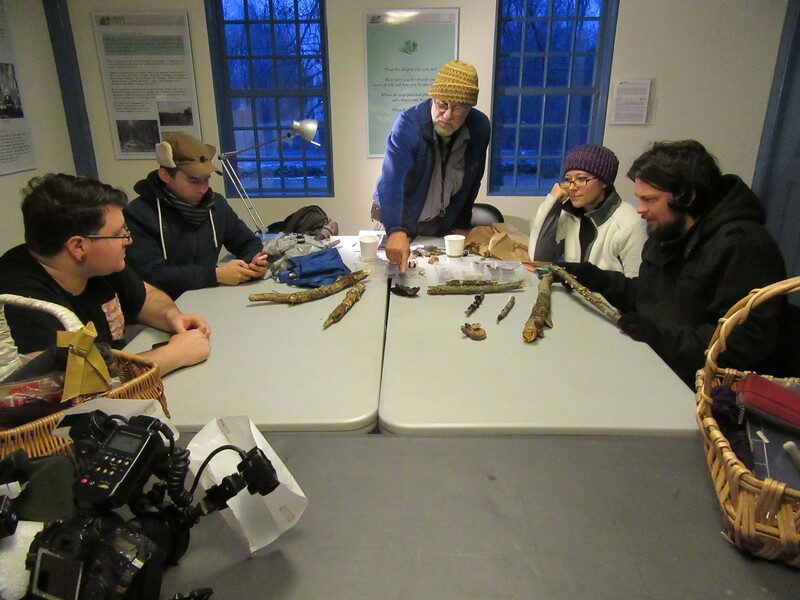 To its credit, the group found nearly 60 different species on the Winter Mushroom Count, despite the snow and icy conditions. Pursuing fungi on this particular grey New England day was an exercise in Thoreauvian Olympics. Much time was spent sauntering, which is akin to walking a step faster than a teenage boy (hoping to miss the school bus), yet slower than the octogenarian couple (aided by canes), who seemed to be skipping past us in the forest. Millman and the mycophiles stooped, knelt, and stretched to examine every rock, log, tree trunk, branch, and pile of decayed leaves with a jeweler’s loop or hand lens. When they found a fungus or a mushroom, (Millman says its futile to make a distinction), each fungi hunter would regard it with great enthusiasm and call out to the others, and explain the significance of the discovery. During the entirety of the mushroom count, voices echoed throughout Estabrook Woods, eager to announce a find: “False Turkey Tail,” “Parchment,” “Brown Witches Butter,” “Milk-white Toothed Polypore,” and so on. Did you know one variety of fungus glows in the dark woods like phosphorescence in the ocean? It’s called “Night Light.” Another is an orange jelly substance. You can smell it and touch it, but don’t eat it. For the uninitiated, and even for the experts, there was a lot to learn on this walk. Millman and the others collected several samples, carefully slipping them into paper bags or carrying them in wicker baskets. There were eight fungi which needed further study to be identified. One woman was pleased to locate a little brown mushroom, or LBM, as Millman (who is also an Arctic explorer and writer) and the other fungi folks affectionately call it. The LBM was found under a cluster of pine needles, yet the group was more interested in the black specks of fungi or “White pine splotch” found on the tips of the needles. “Are there truffles in these woods?” asked one of our companions. “Yes, but not the kind you’re interested in,” said Millman. Millman is loathe to identify which mushrooms are edible. And, won’t. “Edibility is the least interesting aspect of a mushroom,” he said. One of the hunters, the editor of the Boston Mycological Club Bulletin, explained to me sotto voce that many expert foragers will go along for years happily consuming mushrooms without incident, until the one time he or she mistakenly eats a poisonous one and either gets violently ill or dies. The hunt stopped dead in its tracks when it encountered a pine tree encased in a veneer of dried sap and lichen. One of the mycophiles, a grad student, took his loop and examined the tree for fungus with the stance of a dermatologist looking over freckled skin for a bad mole. It was a painstaking process, but he went about the task with extreme patience and was able to discern specks the size of black pepper. Yes. It was fungi, sprinkled along the bark. This young man and the other mushroom counters on the walk reminded me of Henry David Thoreau — stopping, studying, examining, and recording the natural world around us, and doing so with great joy. If “Joy is surely the condition of life,” there was evidence of life all around us on the Winter Mushroom Count. What did we find in Estabrook Woods?